Zambia's Mwali takes African Junior! The African Juniors has produced a number of upstanding champions who have gone on to make an impact on the world stage. 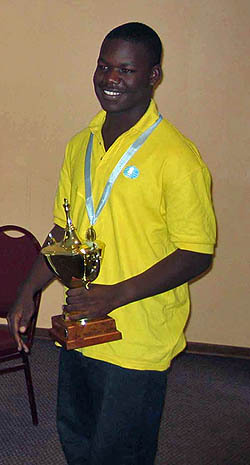 Zambia continues to crank out champions as Chitumbo Mwali is the latest to win the honor of "African Junior Champion." The tournament was held in Gabarone, Botswana 15th-30th of December. Mwali outpaced the field with an 8/9 score, a clear 1½ points ahead of his compatriot Raymond Phiri. As a result, Mwali earns the title of International Master. Former African Junior Champion Heinrich Stander of South Africa took 3rd place after earning better tiebreaks than Zimbabwe's Rodwell Makoto. In the Girls' competition, South Africa made it a clean sweep of the top three medals. Mellisa Greeff only ceded one draw and finished on 8½-½. Her compatriots Suvania Moodliar and Carmen de Jager both had 7-2 and as the only three FIDE-rated players, overwhelmed their sinexperienced competition. The tournament had ten players and was played in a round-robin format. There were no participants from North Africa or West Africa. Other nations competing were host nation Botswana, Angola, Mozambique and Malawi. Uganda was among the most conspicuous absentees.